We love brightly-colored things here in L.A., but compared to some cities, food has kind of been an exception. Chalk it up to our all-natural-everything ethos perhaps, but the super-saturated snacks have been slower to catch on. So what is a would-be unicorn to munch on—and, even more importantly, Instagram—around town? Here are five treats to eat with your eyes as well as your mouth. Chomp Eatery has made quite a name for itself with their signature grilled cheese sandwich known as the Unicorn Melt. In addition to being striped with crazy colors, it’s also a pretty tasty blend of Monterey Jack and provolone cheese (aka ‘unicorn milk’) on toasty bread. Everything at Amazebowls comes decked out in colors, flowers and other delights, but what if you added just a bit of candy floss to top it off? This magical pouf comes from local artisan cotton candy specialist Bon Puf. Obviously, when a unicorn poops, it comes out in the form of a light, sweet meringue, topped with a rainbow of sparkly sugar glitter. Crème Caramel has managed to capture this completely real thing perfectly. 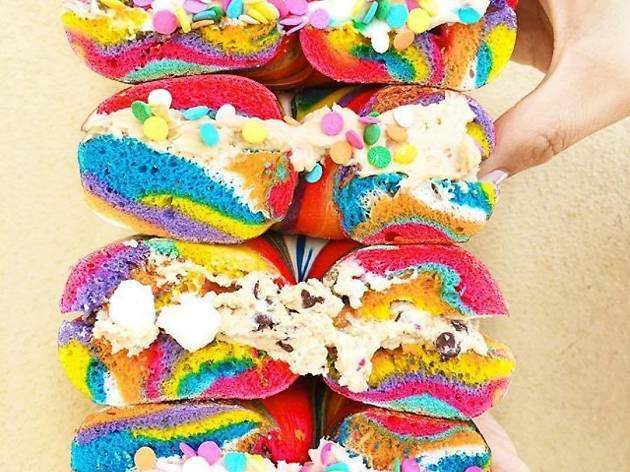 You’ve no doubt seen rainbow bagels all over the internet, but check the tags and you’ll notice they mostly come from NYC. 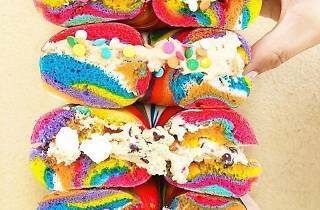 For a local option, check out Bagels and Brew who whip up the colorful carbs on weekends and recommend topping the vanilla-flavored bagels with a dollop of sprinkle-studded cake-frosting-like cream cheese. What else could you do with a cone full of soft serve from Drips and Swirls in a color and wavy shape that would be at home in a Lisa Frank illustration besides cover it in a confetti of sugary sprinkles? Sure, it might turn your tongue blue, but then, who is to say unicorns don’t have blue tongues.